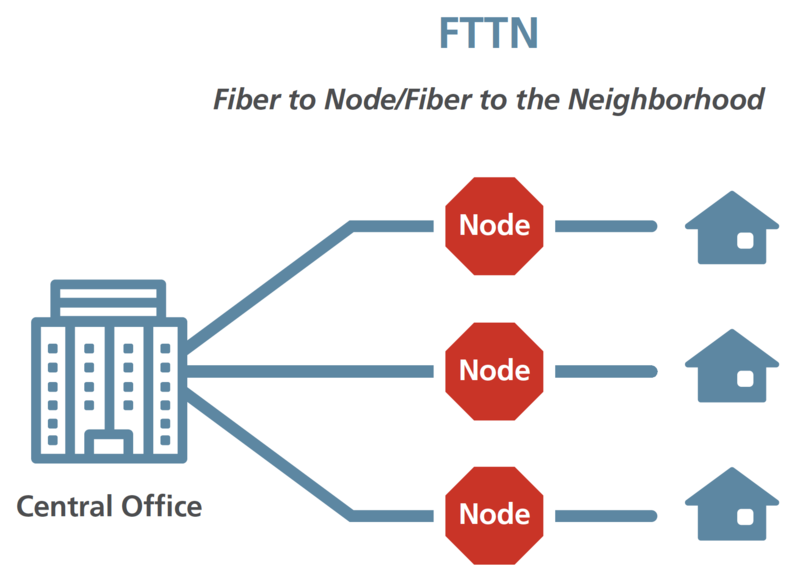 This paper examines CAF II-funded broadband network deployments in two rural Minnesota telephone exchanges, one owned by Frontier and one by CenturyLink. Given that these two companies are the state’s largest participants and due to the basic technical requirements of the program (DSL loop lengths of approximately 9,000 feet so as to enable 10 Mbps/1 Mbps service), they are representative of the CAF II investments being made in the state. The study looked at Frontier’s exchange in Lindstrom and CenturyLink’s exchange in Braham. The Lindstrom exchange is located entirely within Chisago County. The Braham exchange sprawls across Chisago, Isanti, Kanabec and Pine Counties. While every rural community is unique, these exchanges contain characteristics seen throughout the state. Both are quite rural with a land use pattern of small cities, farms, exurban and rural homes, wetlands and lakes. Of the two, the Braham exchange is the more rural and less densely populated. 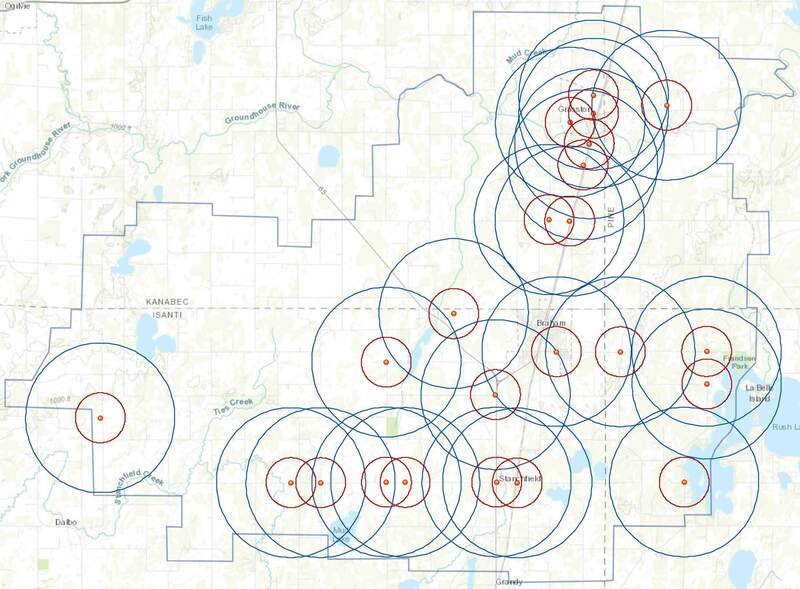 To create a picture of the level of broadband service prospectively available to rural residents and businesses as a result of these CAF II-funded infrastructure investments, CAF II-funded fiber-connected electronics within these service areas were located and mapped. As illustrated below, homes (or businesses) within 3,000 feet of the node will generally experience sustained speeds of 25 Mbps/3 Mbps or more. Properties within 9,000 feet will generally experience speeds of at least 10 Mbps/1 Mbps. Beyond 9,000 feet, properties generally will experience speeds slower than 10 Mbps/1 Mbps. Directly adjacent to the node, 80 Mbps broadband is possible. At half a kilometer (1600 feet), 50-60 Mbps is possible. 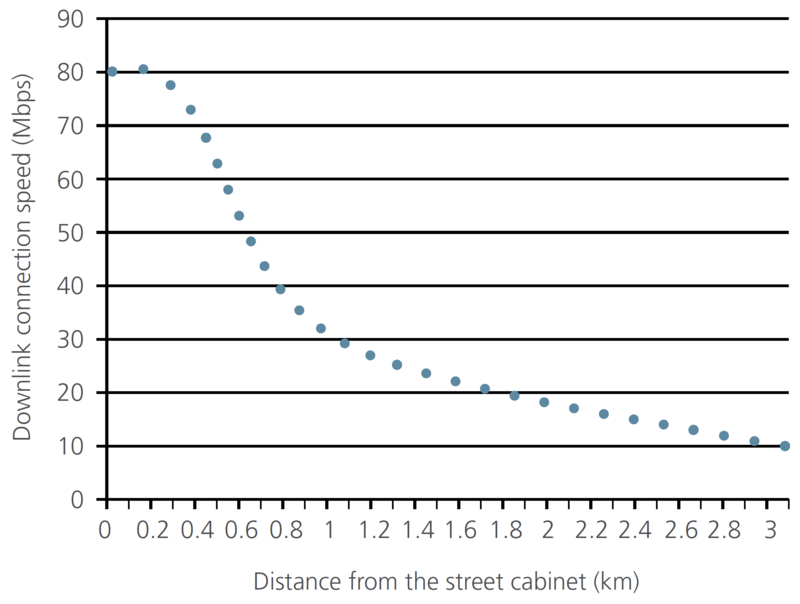 At one kilometer (3,280 feet), up to 30 Mbps can be delivered downstream. At three kilometers (10,000 feet), approximately 10 Mbps can be delivered downstream. Despite several requests, network permits were not available from either public agencies or providers. Instead, the field research went straight to the source–physical, observable installations. The equipment installed in each exchange as part of the CAF II-funded build was located and mapped, and circles were drawn at 3,000-foot and 9,000-foot radius to show the tiered service available by distance. Each dot represents an identified node. Each red circle has a 3,000-foot radius; blue circles have a 9,000-foot radius. As illustrated above, the areas within the red circles should have access to broadband of speeds of 25 Mbps/3 Mbps or more. 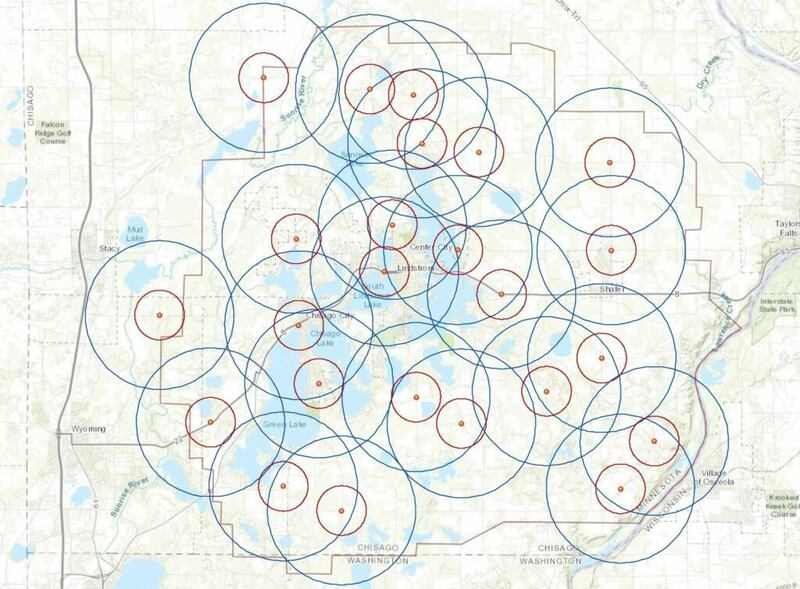 The areas within the blue circles but outside the red (donut shape) will have access to between 25 Mbps/3 Mbps and 10 Mbps/1 Mbps. Areas outside of a circle will have slower speeds based on their distance from the node. Second, the lack of transparency from CAF II recipients about their network deployment plans makes it difficult for communities to do their own planning and leverage public investment. Let’s take a closer look at the communities.